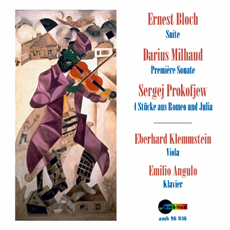 Sergej Prokofiew (1891-1953): Four Selected Pieces from the ballet "Romeo und Julia"
Whereas the first two CDs with the violist Eberhard Klemmstein (Sempre Viola amb 97917 und Viola Ancora amb 97992) are dedicated to smaller pieces of an encore character, the third CD in this series now presents two bigger original compositions as well as a significant arrangement for viola & piano from the 20th century. All of the three works belong to the classical modern period, but they could hardly be more different in style. The cover picture (Marc Chagall: The Fiddler) illustrates the common Jewish roots of the three composers. It was a deep personal striving of Ernest Bloch to develop a Jewish musical language basing on the old Temple Songs. His style bears strong impressionistic traits. Darius Milhaud, probably the most versatile among the composers of the “Groupe de Six” tends basically to classicism which becomes clearly evident in his chamber music and, here, above all in the string quartets. Sergei Prokoffiew owes his great popularity, among other things, to his skillful mixture of classical forms and romantic approach vested in a novel, modern exterior. This versatility is also convincingly manifested in the treatment of the viola parts. Bloch not only exhausts the sound nuances but also the range of the instrument to the very limits. Milhaud, in contrast, employs the viola as a conventional melody instrument like in his pieces for violin or cello. An important contribution of the Russian violist Wadim Borisowski is the creation, with Prokoffiew’s consent, of an arrangement of several movements out of the orchestral suite “Romeo and Juliet”. This arrangement, although reduced to only two instruments, succeeds in unfolding the entire greatness of this music. The recordings were made in the “Reitstadel” in Neumarkt, Bavaria as a co-production with the Bavarian Radio.